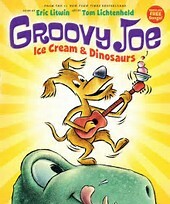 Our Cover to Cover Book of the Month for May is Groovy Joe Ice Cream & Dinosaurs by Eric Litwin. Groovy Joe is an awesome dog with some awesome ideas! Sharing is one of those awesome ideas. And despite being in love with his doggy ice cream he shares it with some HUNGRY friends! Print motivation is the interest and enjoyment of books. Promote this skill and the love of reading by making stories interactive. Groovy Joe: Ice Cream & Dinosaurs is full of repetition, providing a perfect opportunity for the child to interact with the story. When the book asks, “What did Joe say?” give your child the opportunity to answer. See if you can find other repetitions that provide the same opportunity. Send a picture of you and your child making music together! Be creative! We can’t wait to see what you loved about Groovy Joe Ice Cream & Dinosaurs!